...and just like that I am a working mama! Today was day one of work and I couldn't have asked for a better day, or transition back to routine! I know I have been talking about this topic a lot lately... getting ready for these new routines was definitely giving me a little anxiety leading up to this day, but now that its over I feel so much relief! Jet was the happiest little kid at Grammy's house, and was only slightly amused with me when I showed up to get him at the end of the day! I mean what is there not to love about playing all day and having kids to do it with! I just can't quite compete with that, and I am fine with it! Last night I felt like a kid getting ready for my first day back to school.... I was excited to pick out my outfit and get it all ready for Monday morning....despite the snow I was excited to put on a skirt and get dressed up again (a nice change from my usual relaxed mommy attire!). I kept it simple and warmer today, spring colors just weren't calling out to me with the gloomy skies, so I opted for black, blue and golds. 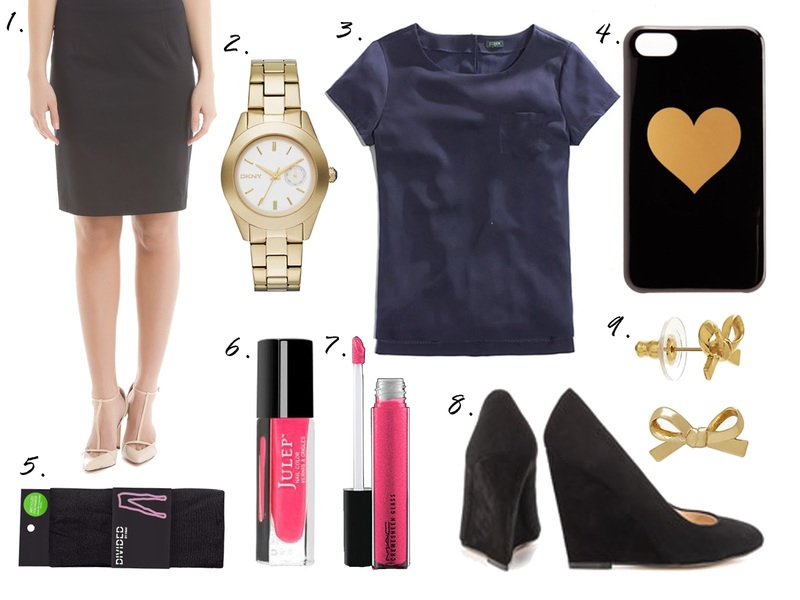 Pencil Skirts with tucked in t's are a staple for me when I am working, comfort if key while maintaining a professional look and this allows for both! Cheers to a great Monday and a big week of firsts... including a much anticipated 1st Birthday party!